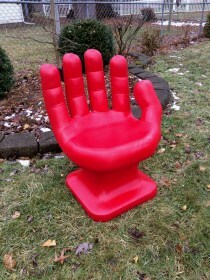 Giant Hand Shaped Chair. It is solid Red in color. It is surprisingly very comfortable to sit in. The hand chair is great for: Patio, Pool-side, Outdoor Deck, Game Room, Classroom, Garage, Bedroom, Basement, Billiards Room, College Dorm, Home Office, Frat House, Workplace Break Room. Great for playing video games, watching a football/baseball game or just relaxing in. The chair is very durable and thick (approximately 3/8” thick). It can be used outdoors or indoors and can easily support 350+ pounds. The plastic is solid colored all the way through, UV light resistant and will not fade or peel. If using the chair outdoors it easily cleans up with windex/fantastic or any non-abrasive spray cleaner and can be left outside year round in any climate. 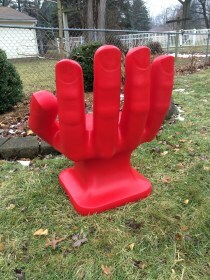 Base to finger tips (Height): 32"
The weight of the chair is approximately 27 pounds. The color of the chair pictured compared to the actual chair can vary slightly due to different computer monitors and different batches of plastic.